Last week Apple launched the iPhone 7 and released iOS 10 with updates that are great for business. We’ve been working hard on innovations that will help you while you’re hard at work. 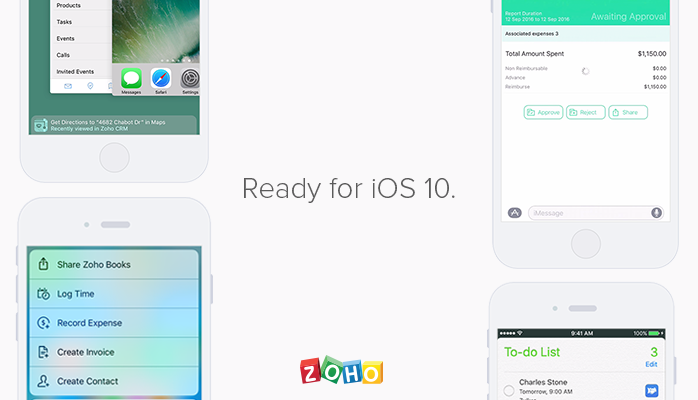 Six Zoho apps are using iOS 10’s new features and we’re updating more more apps soon. Find out how you can harness new features that are already helping people do work faster and simpler than ever. Apple unveiled a new app store for iMessage that lets you pull information from apps and send it to colleagues in text messages. Whether you’re sharing an estimate for a job to come or sending an invoice for a job well done, do it faster with our new iMessage apps for Zoho Books and Zoho Invoice. These apps add payment links to your messages so your clients can respond quickly. The entire process of sharing expense reports, from submission to approval, can be worked out in iMessage. Plus, if you want to share a thought you jotted down in Zoho Notebook, you can send it from iMessage. Apple has opened its caller ID to third-party apps. Before this update, sales reps couldn’t know if an unrecognized number was an important customer or a spam call that would waste their time. Now you’ll always know who’s on the line so long as their phone number is saved in Zoho CRM, Zoho Mail, Zoho Invoice, or Zoho Books. 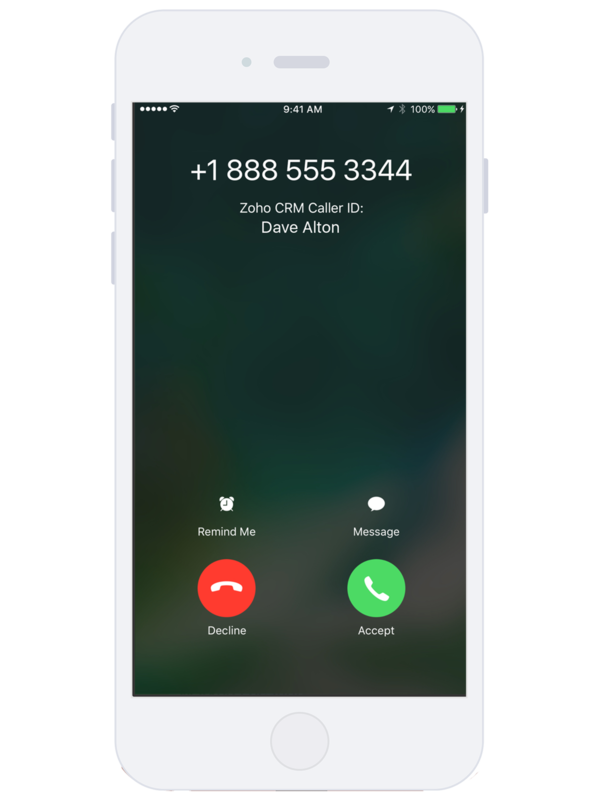 The caller ID integration makes it easier to keep your personal contacts and your business contacts separate. 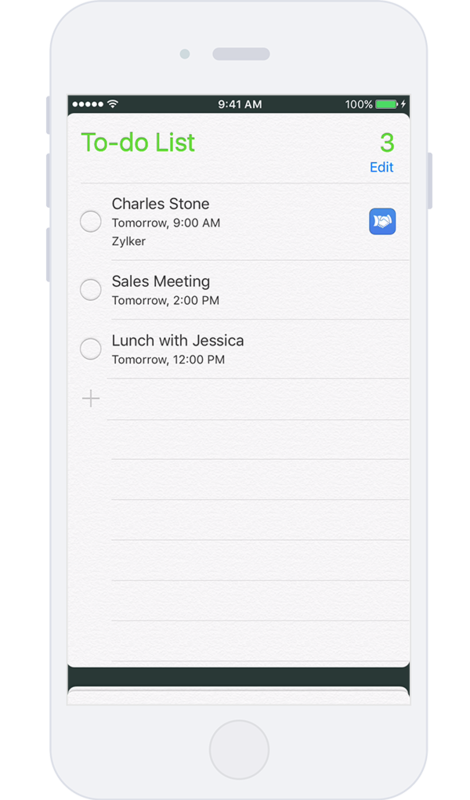 With iOS 10, Siri can set reminders that are contextual to the screen you’re looking at. When you’re looking at an invoice or a lead to follow up with, just tell Siri, “Remind me about this later.” Your phone will remember exactly which invoice or lead you’re looking at, and create a reminder that links to it. When it’s time to follow up, just tap on the reminder and your phone will return you to the screen you were looking at while you set your reminder. Siri also makes it more convenient to search through your photo cards in Zoho Notebook. Zoho CRM and Zoho Notebook have access to Siri’s powerful voice recognition technology. Now these apps can automatically transcribe your spoken notes into text notes. The iPhone’s Spotlight Search has been out for a while, but iOS 10’s expanded functionality lets us give you a more complete picture of each customer. Search for a customer’s name and you’ll see your invoices and their CRM record on the same screen. Spotlight Search lets you pull up your notes in Zoho Notebook at a moment’s notice. iOS 10 expands support for widgets, which let you access information and tools at a moment’s notice. With Zoho CRM you can see what you’ve got planned and tap on a contact to start a scheduled call. As soon as a job begins, switch your timer on with the Zoho Invoice widget to log your hours. It’s even more convenient to pull out your phone and start taking notes with Zoho Notebook’s new widget. When you have a contact open in Zoho CRM, iOS 10 recognizes their address and suggests it as a destination in apps like Maps or Uber. No more copying and pasting when you switch between apps. For years, smartphone apps have been treated as isolated tools that each specialize in one area. But we’ve always believed that applications should be built to work together. iOS 10 fits with our philosophy because it opens up possibilities for apps to integrate contextually. Whether you’re driving to the next prospect, answering a customer call, or sending an invoice, we’ve thought about how you can do it better through contextual integrations. We hope that our hard work makes your job easier.